I am thrilled that today I have an actual DIY project for you, one that requires saws and wood and physical strength. And, I have to admit, I have a have a “guest” crafter of sorts who made this wonderful bench, my dear sister Ruth. Ruth is my older sister, and she is the best older sister there ever could be. She is the mother of 4, and has number 5 on the way. Like me, Ruth is big into her projects, but as you can see, her projects are a little more impressive than mine. In fact, I worry sometimes that she is addicted to diy-projects. She is slowly making her way through her home remodeling as she goes. 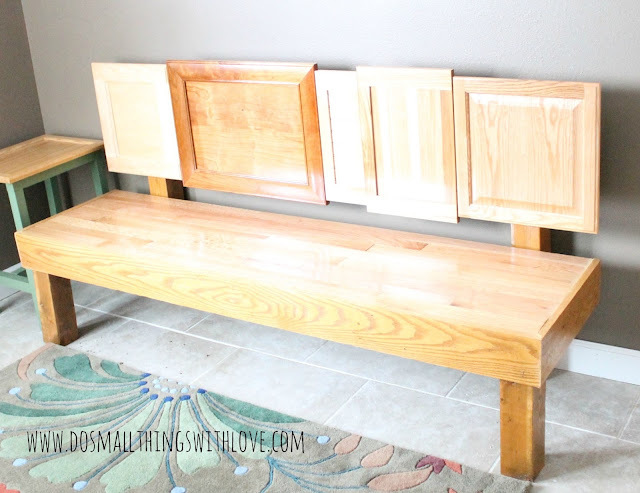 A lot of the left-over supplies from a major remodel she did at her house were used for this bench. Step 1: after gathering all the supplies, the first thing Ruth did was lay out the cabinet doors she’d be using for the back of the bench. She purposely chose a rich variety of styles and woods. 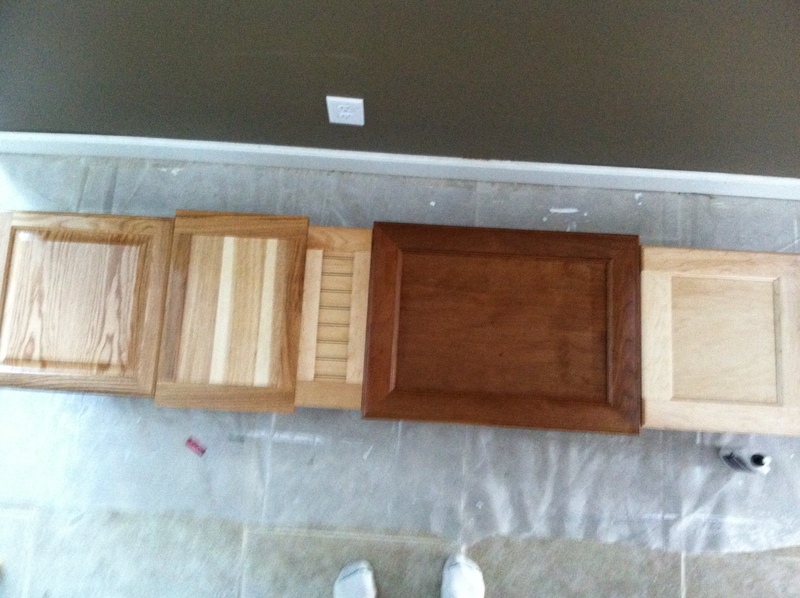 From left to right the cabinets are Maple, Cherry, Maple, Hickory, and Oak. She backed the cabinet doors with a piece of plywood. Step 2: Build the frame for the seat. Since Ruth was working with scrap wood, her frame was heavy-duty. She used 4×4’s. You certainly don’t need to use 4×4’s. Step 3: Add the legs. For the front two legs Ruth once again used 4×4’s, but cut notches in them so they fit into the corner of the frame. The two rear legs extend up and are what the cabinet doors are fixed to. Step 4: Cover the bench with flooring. Yup, she used wood flooring for the seat of the bench. First she laid a piece of plywood over the frame of the seat and then nailed the flooring into that. Step 5: Frame up the seat. She used left over door framing for this part. Step 6: Screw on the cabinet doors for the back of the bench. Step 7: Finally, pull out the polyurethane and seal it up! My sister had a little helper for this part! Now this is true creativity. Annnnnddddd….as you can see, while I was visiting, and all nine cousins were together, the bench got a lot of use! I am so glad that my sister isn’t a blogger and that I get to share this project with you! That’s fabulous!! What a unique and fun idea. Had to pin it … thanks! Wow, I can really see this as a platform bed. This is beautiful. Thanks for the idea!! You have been featured at The DIY Dreamer. Come on over and grab your featured button, you deserve it! Wow, Nancy, this is such a clever idea…and it turned out beautifully! that is really cool, would never have thought of that!